Ibiza Royal Beach Lantana is a delightful three bedroom apartment with its own roof terrace. There you'll find day beds and a comfortable seating area than can be covered if required. Perfect for relaxing or sunbathing at any time of the day. Looking forward to the summer 2018 season in Ibiza and we have a new addition to our selection. the majority of our apartments in Bossa Azul look down and across the garden and pool to the sea. This particular apartment is on what is called the sunset side of the building. 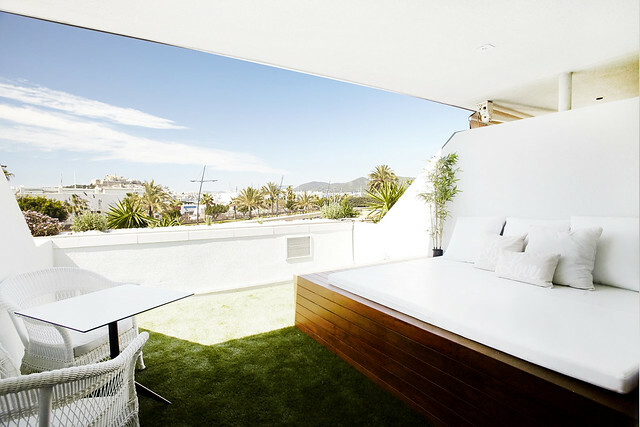 What this means is that the terrace looks both towards the sea and the hills surrounding Ibiza town behind which the sun sets. For more details please see our website. 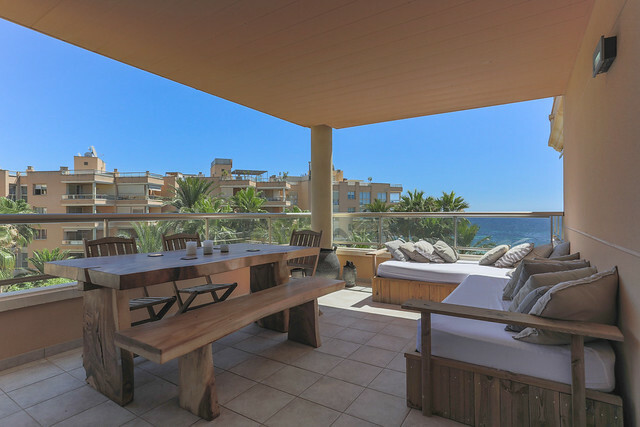 We have just added another three bedroom apartment to our Bossa Beach selection. It's really nicely furnished and has great views of the garden, beach and sea. For more details please see our website. We now have many special offers and discounts available for June. 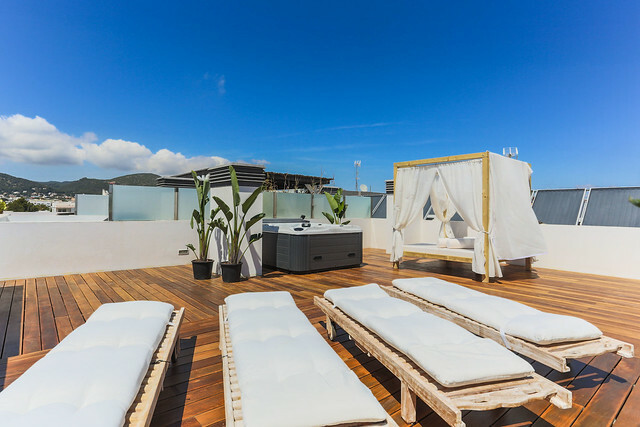 For example Ibiza Royal Beach Oceano is a delightful three bedroom apartment with its own roof terrace complete with loungers, day bed and jacuzzi. A week in June was €3,500 but with a 40% discount it's now just €2,100. For more details on this and other offers please see the website. We still have some great discounts on some fantastic apartments for the rest of May. You can see a selection of special offers on our website but please contact us now on info@apartments-in-ibiza.com for details of many more. Just type 'FACEBOOK MAY OFFERS' into the subject box for reductions of up to 30% on selected apartments. Ibiza Royal Beach 2-3-1 is a fairly recent addition to our selection of Ibiza apartments. Its interior design is of a very high standard. It's also a frontline apartment with wonderful seaviews out to the nearby island of Formantera. If that wasn't enough this apartment is on special offer for the month of May at a discount of 20% off the original rate. This is a truly fabulous apartment with all sorts of luxury features including three bedrooms all with en-suite bathrooms. It has been stylishly and comfortably furnished by a collaboration between La Maison de l'Elelephant and Ohm Ibiza. 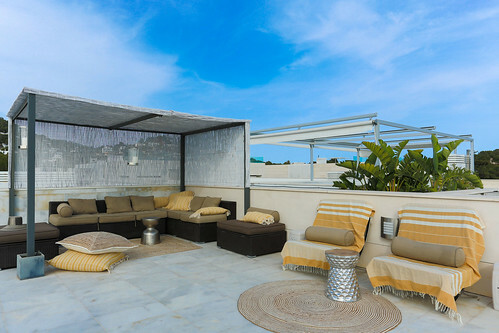 The roof terrace has a comfortable seating area, dining for six and a small private pool. It also has amazing views of the surrounding hills, Formantera, the Dalt Vila and Talamanca Bay. For more details and to book this wonderful apartment please see the website. 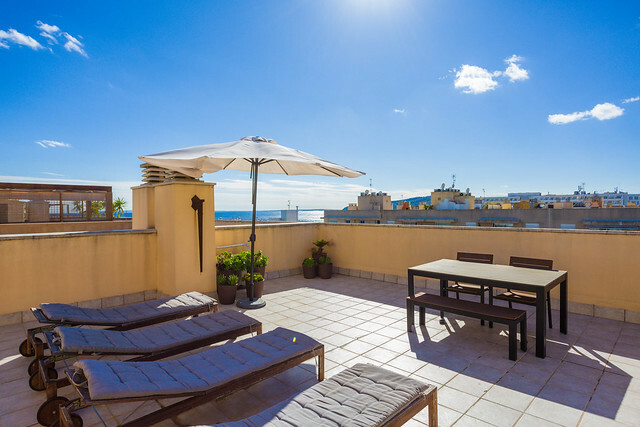 This four bed apartment has amazing views of the marina and Dalt Vila. 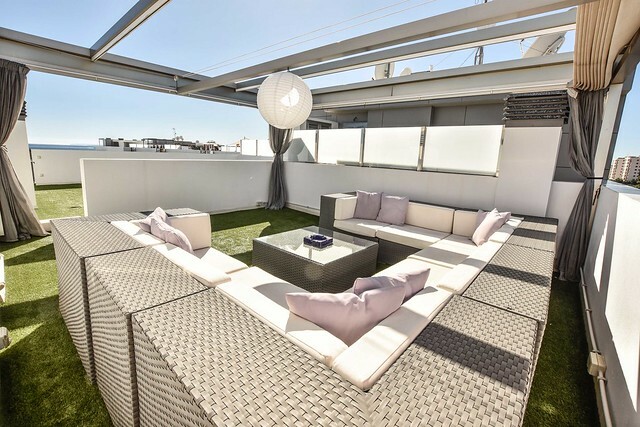 It also has its own roof terrace which means you can sunbathe all day if you wish. This apartment has has a complete make over and is wonderfully designed and fitted throughout. Being on the top floor means it has its own roof terrace. With three bedrooms and two bathrooms it's perfect for a large group or family. For more details please the dedicated page on the website. Casa Maria is a typical ibicencan finca that has been decorated in a thoroughly modern style. With three bedrooms and being just outside Ibiza town, it's ideal for a family or small group of friends. The owners have big plans for the place. By next year there should be a pool and a much improved outdoor area. Looking at what they've already done it's a safe bet that it will look sensational. For more details please see website. Along with Sa Marina and Las Boas 2 this will be the third two bedroom apartment in the Marina Botafoch area that we've recently added to our website. The apartment itself is really very nice and beautifully decorated. The White Angel apartment building is also interesting with a pool bar, jacuzzis and outdoor comfortable seating amongst its attractions. Being just outside of Ibiza town, Jesús is a popular location for travellers to Ibiza. We don't have many apartments in that area but this new two bed is a great addition to our portfolio. This delightful two bed apartment certainly has the 'wow' factor. 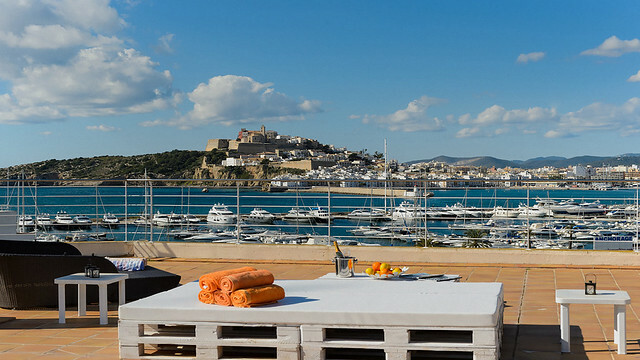 Situated on the Paseo Maritimo it's just a short distance from the port area of Ibiza town. 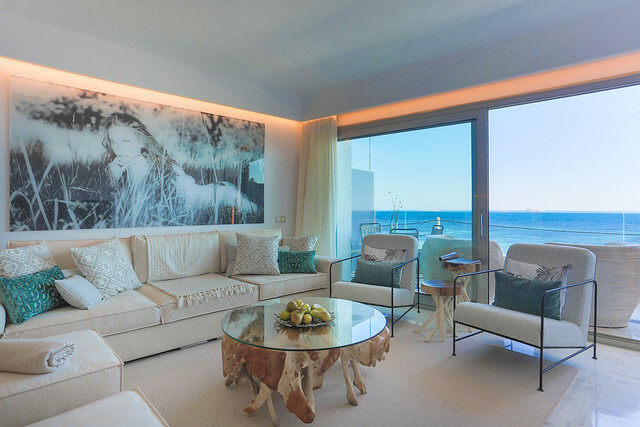 Located in the exclusive Marina Botafoch area of Ibiza town, this is our second two bedroom apartment in the iconic Las Boas building, designed by the French architect Jean Nouvel. The decor of the apartment certainly does the architecture proud and it has fabulous views across the pool towards the marina and Dalt Vila. This four bedroom apartment was one of the very first we rented when the company started. It's as popular today as it was back then. As you can see from the new pictures, it looks as good as new. 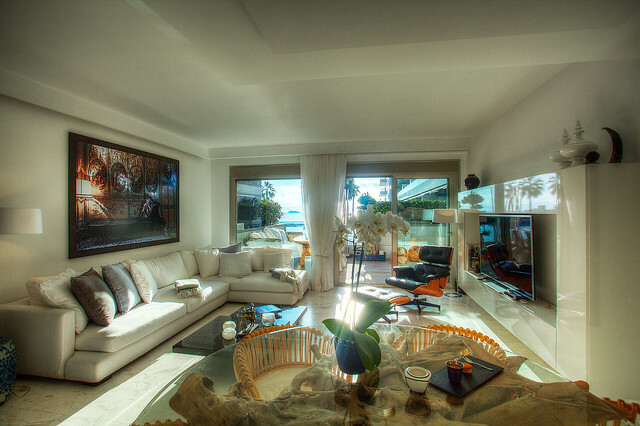 Ibiza Royal Beach Crystal is our one and only five bedroom apartment. It's been completely reshot and looks quite wonderful. For large groups or families it's ideal. For more details please see its web page. We have added three new front line two bed apartments to our website. They are all in the Bossa Marine building in the Playa d'en Bossa area of Ibiza town. 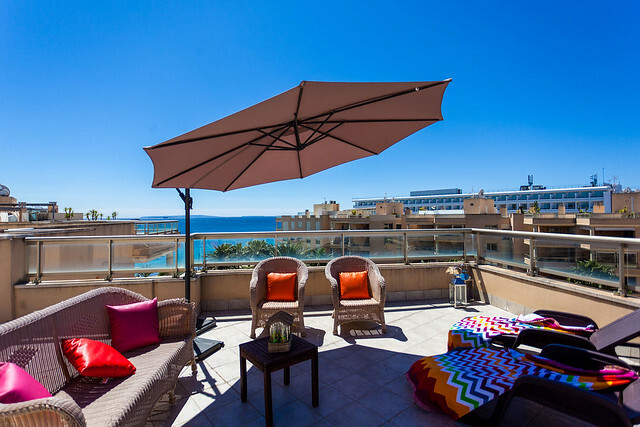 The striking feature of these apartments is the wonderful sun rise sea views from the balcony. Villa Can Prado isn't a new addition to our villa selection but it has been completely re-photographed. This modernistic four bedroom property looks fabulous in the new images.